Adina Marina Serban, Dariusz Grzemny, Georg Pirker (representative of the DARE network), Gisele Evrard Markovic (representative of the SALTO Training & Cooperation Resource Centre), Gulesin Nemutlu Unal, Iva Zenzerović Šloser, Joanna Pankowska (representative of the European Youth Forum), Ljubov Lissina, Mara Georgescu (representative of the EU-Council of Europe youth partnership), Mohammed Alsaud, Nadine Lyamouri-Bajja, Natalja Gudakovska, Pieter – Jan Uyttersprot, Prof. Dr. Albert Scherr, Prof. Dr. Theo Gavrielides, Sabine Klocker, Sara Cincurova. 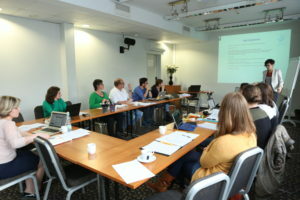 The Expert group was facilitated by Hanjo Schild. 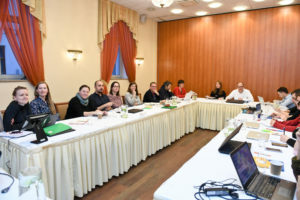 Miguel Ángel García López is an experienced consultant, evaluator and trainer in the field of Human Rights Education at European level who put together the mapping synthesis report as well as transnational HRE report for this project.